Maintenance and servicing of fire extinguishers should be performed by a licensed and insured fire extinguisher servicing company that has the proper tools, training, recharge materials, lubricants, manufacturer’s servicing instructions, and replacement parts. Monthly – Quick check to ensure that the fire extinguisher is in the designated place with no obstruction to access or visibility, and that the pressure gauge indicator is in the operable range. Annually – A thorough examination of the basic elements of the fire extinguisher performed by a trained person who has undergone the necessary instructions and has the manufacturer’s service manual. In no case shall the clearance between the bottom of the fire extinguishers and the floor be less than 4”. Any fire extinguisher that can no longer be serviced in accordance with the manufacturer’s maintenance manual is considered obsolete and shall be removed from service. 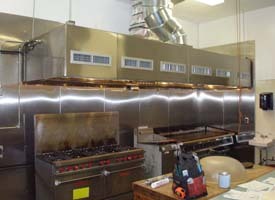 For more information on stainless steel fire panels, call 585-235-3310 or email us. NFPA-96 Section 4.2.1 requires a clearance of 18” to combustible material, 3” to limited-combustible material, and 0” to noncombustible material. NFPA-96 Section 5.1.2 requires that all seams, joints and penetrations of the hood enclosure that direct and capture grease-laden vapors and exhaust gases shall have a liquidtight continuous external weld to the hood’s lower outermost perimeter. 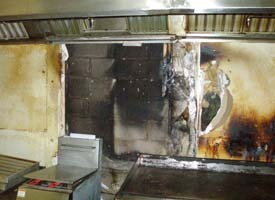 This helps to contain a fire within the hood where it can be extinguished by the exhaust hood’s fire suppression system.